Q. At what age will my child be eligible for admission in each level? Q. What is the teacher-child ratio at Shannenkid's Pre-school? Q. What kind of curriculum do you follow? We make teaching more lively and interesting. We teach languages, mathematics, social studies etc through a series of activities like games, songs, free play, gardening, construction activities etc. The learning is not just limited to cognitive development, but also for the overall development of the child. A few methods and techniques included in this method are Role plays, Projects; Theme based learning, Field trips, Puppetry etc. Q. What are your unique differentiators? At Shannenkid's Pre-School, we believe that the environment is the third teacher. Our pre-school environment is richly and carefully resourced to stimulate learning and development in children. The environment will engage your child to become an active participant in the learning process. 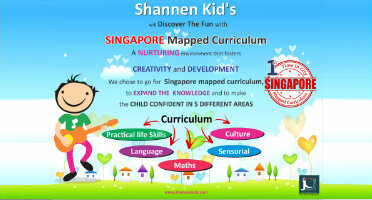 At Shannenkid's Pre-School, our greatest strength lies in the exceptional quality of our teaching staff. They are well-qualified, experienced and have a deep understanding of children. Our teachers are frequently provided opportunities for training and professional development..
We view parents as our partners, advocates and COLLABORATORS and involve them in every aspect of children's learning. The school maintains an open door policy and you will be continuously updated about your child's progress through our in-depth documentation process, where teachers maintain records of your child's work. Q. Is outdoor play supervised? Yes, in our pre-school program each and every outdoor activity is supervised by our well trained and caring staff. Q. Are play equipment at RAINBOW child safe, non-toxic and age-appropriate? Yes, all the equipment and material provided to children at Shannenkid's is of the best quality, age-appropriate, child safe and non-toxic. Q. What is the academic year followed at Shannenkid's? Our academic year runs from June to April, divided into two terms of 6 months each. You need to schedule a visit your nearest Shannenkid's pre-school. Q. Is the fee structure same across all your schools? Q. Will my child face any problems when he/she joins a local school in Grade 1? We use the National Curriculum Framework as a guideline, ensuring that children graduate from Sr.KG and are fully prepared to go on to Grade 1 in a local school. Q. Are there regular parenting workshops and parent teacher meets? At Shannenkid's, we follow an open door policy where parents can meet the teachers any day. We organize parents teacher meet every month where your child's work is displayed. Teachers also maintain a portfolio of your child's progress which will be shared with you.